Are your pets more like furry members of your family? If so, you’re probably interested to know which states in America provide the most enriching and safest environment for animals. To find out, we took a look at 2015 data from the Bureau of Labor, the Animal Legal Defense Fund (ALDF)*, and online pet resources like BringFido.com. Then, we ranked states based on the strictest anti-cruelty laws, highest percentage of no-kill shelters, most pet-friendly hotels and parks, and more. Because when it comes to your fur babies, we know you want nothing but the best! To top things off, we’ve updated the article to include a list of safety tips and tricks to help you and Fido combat seasonal changes. *ALDF data has since been updated to 2017 Rankings. The Pacific Northwest proves to be one of the best places to live for people and their pets. Although some of Washington’s cities ban pit bulls, a lot of the state welcomes pets in parks, restaurants, hotels, and more. Washington has the 13th best anti-cruelty laws and takes animal abuse very seriously. With so many animal lovers, Washington makes a wonderful place for people and their fur babies. Itty bitty Rhode Island has some of the best anti-cruelty laws in the country—coming in seventh in the nation for animal protection—and the best overall health and wellness factors for pets. Since Rhode Island is lined with pristine white beaches, it has designated 27 beaches and trails statewide as pet-friendly, so animals and their people can enjoy the outdoors together. Just grab a frisbee, load your doggies, kitties, or bunnies up in the car, and enjoy the safe, happy, and healthy environment Rhode Island provides for animals. Toto may have had it tough in Kansas, but today’s pets get along just fine. Besides its ban on pit bulls and rottweilers, humans and their beloved animals may frolic through 38 trails and beaches, stay in 370 hotels, and more. About 30 percent of its animal shelters are no-kill and provide homeless pets with safe respite until they find their forever homes. If you love animals and live in Kansas, you can adopt from the state’s 87 shelters to ensure every deserving animal find a home. The start of the American Revolution is also the 10th best place in the U.S. for anti-cruelty legislation. That means animals and pets in Massachusetts have greater protection against abusers and people who harm animals face much more severe punishment. This is great to see and bodes well for animals statewide. Massachusetts also has over 1,600 vets to keep pets in ideal health and 208 dog-friendly hiking trails, beaches, and parks. As of 2017, pit bulls are the only restricted breed in Massachusetts. The Beaver State is named after an animal, so it’s no surprise that Oregon made it as one of the best places in America for pets! The folks living here enjoy a ton of the awe-inspiring national parks, lush greenery, and gorgeous beaches with their pets; Oregon has over 200 dog-friendly trails, beaches, and parks as well as 240 pet-friendly businesses. Like Colorado, Oregon does have certain breed restrictions. In order to make Oregon an even better place for people and their pets, we’d love to see all breeds welcomed into the community and culture. From hiking and skiing to enjoying the average 300 days of sun, Colorado residents and their pets have a lot to live for. 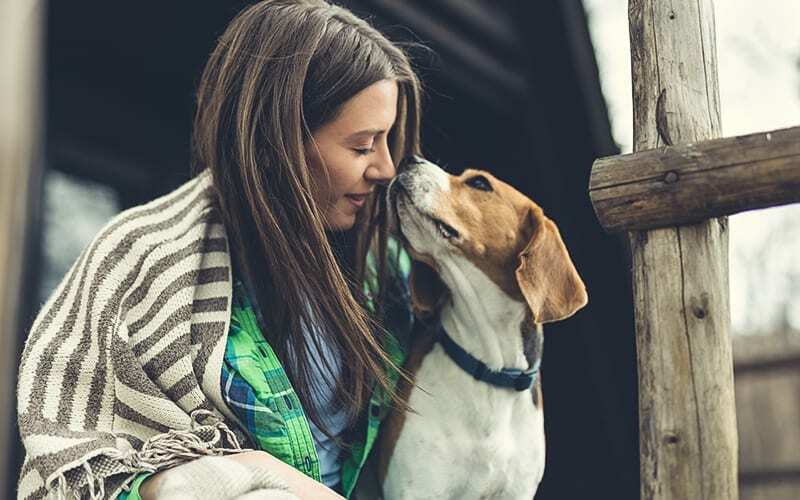 Pets specifically can run and play in over 1,000 pet-friendly hotels and 200 pet-friendly trails across Colorado The state’s 1,900 veterinarians also help keep these pets happy and healthy. The one major con pet-owners might find in Colorado is that seven cities in the state ban all fighting breeds, including pit bulls, American bulldogs, and more. We’re aware that these cities believe they’re protecting their citizens, but people who raise these breeds with love know they are no danger to anyone. When we say the name “Oklahoma,” a famous show tune might pop into your head. But now, the Sooner State has given us something to remember it for yet again: it’s the fourth-safest state in America for pets. Nationally, Oklahoma has the 17th best anti-cruelty laws, meaning its legislation provides animals with the most rights and punishes offenders with the strictest sentences. While we’d like to see a higher percentage of no-kill shelters, Oklahoma does offer pets solace with its 33 dog parks and pet-friendly trails and 93 dog-friendly restaurants. Overall, Oklahoma seems to be an enriching, safe, and healthy place for people to raise their beloved cats, dogs, and other furry babies. Arizona is truly for the outdoorsman/woman—and his/her nature-loving pets! With mild weather, hiking, biking, and more adventure, this place is great for pet-lovers based solely on that. It’s also the 10th best state in the country for its percentage of no-kill shelters and 11th for its strict anti-cruelty laws. Hilary Hager from Humane Society of America says that “A truly safe community ensures that pets can stay with the people who love them, even when they fall on hard times, and ensures that animals already living safely in the community remain undisturbed.” And based on the 629 pet-friendly businesses, over 900 pet-friendly hotels, and hundreds of hiking trails for animals, it seems like people here have taken her philosophies to heart. Virginia is for lovers and, apparently, animal-lovers too! Over 2,500 veterinarians practice in this southern state and its state legislation has made this the 19th best state in the country for anti-cruelty laws. On top of that, there are 371 dog-friendly restaurants and businesses in Virginia, so people and their pooches can enjoy running errands together. The major downside is that 15 percent of its shelters are no-kill, so animals without a home don’t have it nearly as good as those who are loved. Vacationland is nothing but a vacation for the pets that live here. We’re happy to see that Maine has no breed restrictions and 76 dog-friendly beaches, hiking trails, and dog parks—and nearly 1,000 pet-friendly hotels. The only thing we’d like to see improve is the amount of Maine’s no-kill shelters; about 70 percent euthanize due to overcrowding. However, that’s just another great reason to adopt a pet and save a life in Maine—that, and the fact that this state doesn’t have any registered dog breeders, which means breeders here may not be doing so responsibly or ethically. No matter what state you live in, weather and holiday chaos bring risks that can impact your furry friends and family. And since your furry friend is like family, make sure they stay safe, happy, and healthy regardless of the season or holiday. Keep food and water accessible. When Fido’s thirsty, he can’t walk over to the kitchen cabinet and get a glass for water (though if he had two thumbs, we’re sure he would). Your pets rely on you for hydration and food, so wherever you are—at home or on the road—make sure they have access to plenty of fresh water and food. Dogs can be clumsy creatures, especially when they’re excited. Whether your pooch is a klutz or has bodily limitations (like impaired vision or hearing), a first aid kit can help alleviate initial injury and keep Fido safe as you head to the vet. From a dog’s perspective, tall grasses and densely wooded forests present boundless opportunities for fun. And while you certainly don’t want to ruin the adventure, know that parasites (like ticks, heartworm, or fleas) can cause your pet some serious harm. Chat with your veterinarian about parasite protection. Dogs are keen to please you, but be cautious of their limits, including low energy but a strong desire to play, arthritic joints, and fear of storms or gunshots. Summer celebrations often include loud noises like fireworks, and almost one in five dogs go missing because of abrasive noises like storms, gunshots, or fireworks. Keep Fido safe on a leash by your side, or stay at home with your pets and keep yourself safe too. Mulch, fish emulsion, and other garden products can cause serious harm to your pet. Read the product’s fine print before you buy it, and keep items up high and away from Fido’s nose. If your pet does consume a potentially poisonous substance, call the ASPCA Animal Poison Control Center. This resource is available 24/7, every day of the year and can be just as valuable as an emergency vet visit. Remember: hot pavement hurts paws. Come midday, pavement and sidewalks can be hotter than Hades and injure your pet’s sensitive paws. If the pavement or sidewalk is too hot for you to walk on barefoot, it’s safe to say that it’s too hot for Fido. You don’t have to cut out exercise or casual walks altogether—simply take your walks in the early morning or late-late afternoon. High temperatures can do a real number on pets, inducing heat stroke or heat stress. Be aware of how your pet responds to hot temps: make sure they have access to shade and fresh water. Some dogs, like huskies or other breeds with heavy coats, need a little extra help, which is where items like the Ruffwear Jet Stream Cooling Vest come into play. Be mindful of what your pet eats. The holidays are a time for decadent meals and scrumptious treats, but while your dog may wag its tail in hopes of a scrap, keep in mind that many foods can be deadly to pets. If you want to stay safe, avoid giving your pet too much (if any) food from the table and mainly stick to vet-approved treats. Keep doors closed as much as possible. With guests coming and going, there’s bound to be lots of movement in your home. Make sure you watch your pets closely and ensure they don’t escape through an open door. Let your guests know you have a pet in your home so they, too, can be vigilant about keeping tabs on your pet’s whereabouts. Get your pet a collar with a tag. It may seem like a no-brainer, but ensuring your pet is wearing a collar and ID tag at all times is a simple yet effective way to keep your pet safe. A collar greatly increases the chances of a safe return if your pet gets lost. Even if your pet is primarily kept indoors, it’s still smart for them to always wear a collar. You may even want to consider a smart collar with GPS tracking so you can see your pet’s location as well as monitor their health with your smartphone or tablet. Secure your home and your pet while traveling. Holidays are a great time for family travel. But they’re also a prime time for break-ins. No matter how far or near you travel, you’ll be leaving your home unattended and open to burglars. Security systems are a great way to deter thieves and protect your pet from the trauma of an intruder. There are plenty of options available that allow your pet to roam safely indoors without setting off the motion detector, so you can feel confident that both your home and your pet are safe while you’re away. Designate a room in the house for your pet. If your pet gets anxious around strangers, the bustle of the holiday season might be stressful for your furry friend. While hosting holiday parties, keep your pet in its own designated safe space or room. This safe haven ought to have more than enough food, water, and toys, and it will help alleviate your pet’s anxiety. Keep an eye on your pet when you’re away from home. The holiday season is a time when you’re likely to be out of the house doing last-minute shopping, meaning that you might be leaving your pet home alone for hours at a time. Consider installing a pet camera to keep an eye on your dog or cat and see if they are misbehaving. This will also give you peace of mind and allow you to check on your pet’s safety as well as the order of your home. Keep hazardous chemicals stored out of reach. If you purchase any hazardous chemicals (like antifreeze or road salt) to remove snow or ice this winter, it’s essential that you keep your pet away from such items as they pose major health threats to animals. The sweet scent of antifreeze often draws pets in—but it can be deadly. These chemicals can also irritate your pet’s skin, so routinely check their paws for signs of damage, such as rawness or bleeding. Be wary of dropping temperatures. Cold winter weather can pose a dangerous threat to your pets. While some pets can tolerate the cold, pets are still susceptible to hypothermia and frostbite. Watch out for ice and pay attention to below-freezing temperatures while walking your dog or letting your cat outside. If your pet must stay outside, provide extra shelter like a blanket and an igloo or insulated house. And in the case of severe storms, keep an emergency kit for your pet that includes food, water, and any medications it might need. During our research, we found a bunch of interesting information concerning pets that might interest you. Vermont has the most veterinarians per 1,000 residents. Vermont, Maine, Wyoming, Montana and New Hampshire should be the top travel destinations for people looking for hotels allowing animals. Hawaii has the highest percent of no-kill shelters in the nation at 61 percent, compared to the fact that only 25 percent of the entire nation’s animal shelters are no kill. Nine of the 50 US states are free of any city-imposed dog breed restrictions. The states without dog breed restrictions are Maine, Arizona, Connecticut, Hawaii, Minnesota, Nevada, New Hampshire, Oklahoma, and Virginia. On average, there are 0.0244 dog parks per 1,000 residents in the United States. The US Bureau of Labor Statistics reports that only eight states have registered dog breeders. No matter where you live, there’s no doubt you can give your pets a great life. However, it’s important to keep in mind that no matter where you live, you should never take your pet’s safety for granted. To read more about pet safety topics, check out our favorite pet cameras and tips for puppy-proofing your home. To standardize our findings, we analyzed each data set against every 1,000 residents. Then, we looked at factors that directly affect animal safety like the number of animal shelters, no-kill shelters, and animal cruelty laws and weighted them heaviest (20 percent). After that, we looked at wellness factors like the number of veterinarians and dog parks and gave them a weight of 10–15 percent. Lastly, we factored in enriching elements like pet-friendly businesses, hotels, and restaurants and weighted them with five percent. To come up with our top 10 list, we tallied totals from each state to determine the overall Safest States in America for Pets.